It’s an ancient beast Dry Rot… A fungus, which was decaying wood in many more places than Sheffield and south Yorkshire, even before the industrial revolution. Of course there was no treatment then, it was just a case of ripping out the wood and starting again. Over the past couple of decades we’ve discovered dry rot, which needed treatment all over Yorkshire. A quick look through the files reveal that we’ve treated severe Dry Rot attack in houses right across the Yorkshire region. Our Sheffield offices have been very busy with Dry Rot treatment over the past 18 month, since the Sheffield office was opened. 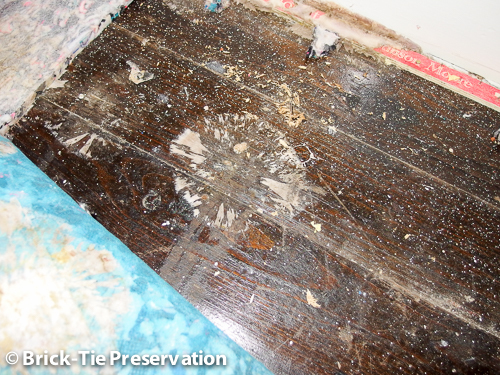 Our client was unaware that the house she was buying had a severe dry rot attack. It was only discovered when we carried out a pre-purchase damp and timber survey for her. The survey was requested by her mortgage lender and we were recommended by a Sheffield based chartered surveyor. The house was occupied but the subtle signs that there were timber decay problems were there for our surveyor to see; leaking gutters, insufficient sub-floor ventilation; high path levels. Of course, within minutes of arriving, he found the problem. This was a bad attack (see below), in a Sheffield domestic semi-detached house only this January (2015). The dry rot had spread from the hallway, into the lounge and kitchen, causing massive damage to the floor timbers, skirting boards and the wall plates hidden under the floor. It was caused by a combination of high path levels, which were bridging the damp proof course, with a leaking gutter, which saturated the base of the walls, where the floor timbers were situated. 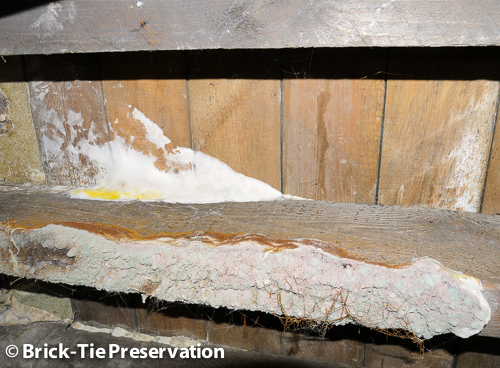 Dry rot needs lots of water to thrive, so that is why it is not very common – most houses are just not that damp. However, it only takes a leaking gutter to saturate a small section of wall, for Dry Rot to take hold. The spores will only germinate on wet wood, but once they do the fungus can spread; through walls, plaster, floor voids, roof timbers and cavities. The dry rot treatment in Sheffield involved sterilising the soil over-site, repairing the gutters, lowering the ground and installing additional air bricks, all before the Sheffield house could have it’s dry rot treated and the floors and joinery replaced. Our Sheffield dry rot treatment team replaced the floor timbers using timber pre-treated with safe but powerful fungicide. All of the contaminated material was safely disposed of to waste and then the walls were sterilised with fungicide prior to specialist re-plastering. The cost of the work was in the thousands, so our client was able to re-negotiate the asking price and of course our written damp and timber report, which meet the Property Care Association code of practice, was accepted by her lender and the buyers Estate Agent. She was able to buy the house knowing that the dry rot treatment would be guaranteed and insured for ten years through the GPI insurance scheme. Our qualified specialist surveyors are PCA trained and know their Dry Rot from the many other types of less severe fungal decay. We are fully insured with correct Professional Indemnity Insurance in place and a company established for 29 years. Reliability, credibility and service are what we stand for in the Sheffield area. For further information or to book a damp and timber survey call our Sheffield number 0114 224 5121 If you are in West or North Yorkshire call our Leeds or York number 0113 232 8433 01904 566577 for prompt attention from our friendly team. Need dry rot advice elsewhere in the country? Try the Property Care Association members list.